“Every Blood Donor is a Life Saver” was the slogan adopted by Leptos Estates for their 15th Annual Blood Donation which was organized by the management and employees of the company in collaboration with the Paphos Coordinating Committee of Blood Donation (SEAD) and supported by the medical team of the Paphos IASIS Hospital. 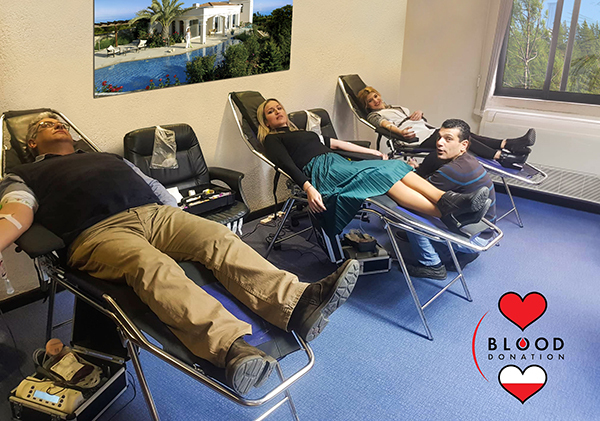 The blood donation, took place at the Leptos Group’s Headquarters in Paphos, with the intention to support the Blood Bank of the Paphos General Hospital and to help Leptos employees and their families as well as those in need. Leptos employees and members of the management volunteered to give blood once again this year. Blood donation is one of the most significant contributions that a person can make towards society. For the people of Leptos Estates it is a joy to give blood, it is actually one of the noblest and greatest donations a person can make. Blood donation is known as the mother of all donations. Photos: From the 15th Annual Blood Donation of LEPTOS ESTATES.